My mom was well known for her talented cooking skills. She did not use recipes or measurements and could make anything taste great. We grew up loving spinach, okra, fish, Brussels sprouts, liver (I never knew it was liver)… and the list goes on. We loved eating. We were never the kind that ate to live but simply enjoyed eating. My mom lived with us for 5ish years from the time Sammy was a couple of months. She was a very very very fussy eater. If you knew her and tried to feed her or watched her eat anything but her own cooking, you know this. She was not trying to be rude but she just truly preferred what she made over anything. My boys loved my mom’s food. Every time Ammama came, they each rattled off their desired meals. My mom always accommodated. They loved her cooking so much that there was never left overs. That is the case now, with thing any one makes but when they were younger this would happen. Here’s the thing, Indian food, most of it requires prep and sometimes consuming prep. I would peel the potatoes, but she always wanted to cut potatoes herself, her way. I was never sure whether to be offended as I was in my 40s, a grown up that cooked too! She was the same with onions or various vegetables. She was very conscious of how her food looked as much as how it tasted. My boys were very connected to their Ammama and loved her very much. Her suffering and death were and continue to be very hard on them. One of the boys looked so sad the other day and when I asked what was wrong, he told me he was missing Ammama. We tried out a new Indian restaurant that serves dosa (an Indian type crepe with fermented batter). 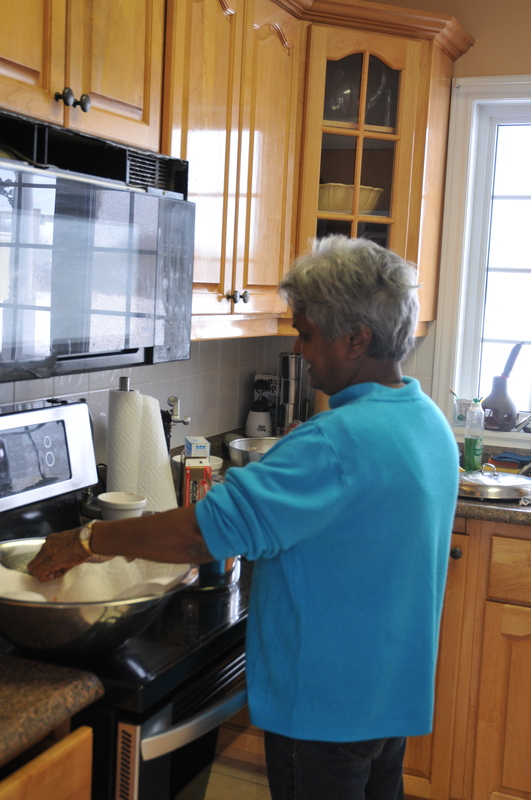 Dosa was something my mom made that we could not eat enough of. One batch she easier stood there made at least 30+. She would just keep making them till the boys said they were full because they felt bad for eating so much. While at the restaurant, the boys were talking about how Ammama’s dosa was better. Or how they preferred Ammama’s tomato chutney to the coconut one that is typical with this dish. There was Ammama’s fish curry that she put green mango in so it gave a sour bit it, or her lamb and gongara and the list continues. Yes, my mom did teach me to cook. I feel pretty awesome when my boys tell me it’s like Ammama’s or almost as good and yet a piece of me knows that my mom’s cooking was top notch. There’s a part of me that wants my boys to remember Ammama’s cooking as the best and continue to hold that memory close to their hearts, as with time the taste will be forgotten yet the memory will be in their hearts. We have such a crazy memory of my mom in the kitchen. If you cook Indian food, you know that as you cook, splatting is a nightmare on your clothes. The stains that can come with the curry, oil, turmeric, etc can do a number on your clothing. My mom knew this and usually put an old top on. I am not sure what she was cooking but if I was to guess, she was likely frying fish for curry (I know, I did say her cooking was delicious but certainly not low fat)! Again, I am not sure of the reason, I just brushed it off as my mom being eccentric… she had out a black garbage bag over her, poked holes for her arms and was cooking away. Sanj came home, saw this and was appalled! He looked at my mom and told her how unsafe that was. A bit of grease or what not and the bag would melt on her or worse she would get burned or a fire would could spark… who knew! This is a memory that often makes us laugh and my mom always looked sheepish when it was retold. I am not sure if my brothers and I every really thought of the work my mom put into the meals we took for granted. She worked full time and then some and yet we always had a decent meal. As I make meals, simple meals, tired and often grumpy doing so, I often think of my mom and the strength this took. I guess God really does give us what we need and He knew what she needed. I love how my mom is smiling and cooking. This picture is of my mom in her element…her love language shouting out to us that were lucky enough to be loved by her. This entry was posted in Boys, choices, faith, Family, food, General, love, Marriage, moments, motherhood, Parenting, Reema Sukumaran, relationships. Bookmark the permalink. Dear Reema, I found your blog just now completely by accident and I am very sorry to hear about your mother’s passing. We were your neighbors back in Asansol, when you were a baby (and you are the same age as my younger sister). Your mother, Gloria, and mine, Agnes, were very good friends who used to meet every evening. Your mother would come over after the sun had gone down and it was cooler. She used to be slim, had a nice smile and I recall that she was a nurse. I believe that you had a brother named Rajiv. In approximately 1969, your family moved to Kettering. That’s just about all I can remember. My mother lives in Florida and is not able to understand but she would send her condolences too. I will share the sad news with my siblings, who remember her. May her soul rest in peace and may God bless her and you.